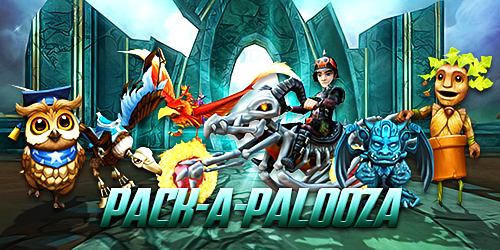 Now through July 23rd, 2017, you can save up to 50% off all Packs in Wizard101 and Pirate101! All Hoard & Lore Packs are 50% OFF! All Jewel Packs are 50% OFF! Dragon's Hoard, Kirin's Hoard and Skyvern's Hoard return for a limited time! Halloween Packs return for a limited time! Mega Snack Pack, Farley's Gardening Pack and much more on sale! KingsIsle is giving away a free Mystery Pack in Wizard101 and Pirate101 - you win one of the amazing hoard packs or lore packs! Redeem yours by clicking the pictures below. This offer is limited to one pack per account and ends on July 23rd, 2017, at 11:59pm US Central Time.